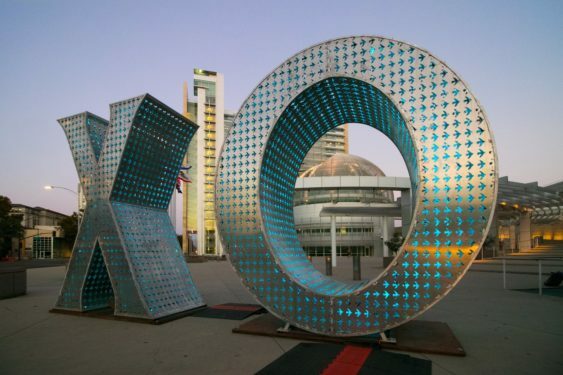 In celebration of Valentine’s Day, the City of San José Office of Cultural Affairs invites you to share your love for public art by having your photo taken in front of the artwork “XO”, by Laura Kimpton with Jeff Schomberg at San José City Hall with the people you love—friends, family, co-workers, or that special someone. Professional photographer, David Lepori, will be stationed in front of the artwork on February 14 at lunchtime from 11:30 am to 1:30 pm, and again in the evening from 5:30 pm to 7:30 pm. Each group will receive a free copy of their photo printed on the spot. Limit one per group. Photographs will be taken on a first-come, first-served basis while supplies last. So plan to get there early.